World Council for the Cedars Revolution - 11 Years ago today, the "Cedars Revolution"
Home News Content Blog Blog Items Analysis 11 Years ago today, the "Cedars Revolution"
11 Years ago today, the "Cedars Revolution"
On March 14, 2005 one million and a half Lebanese people from various backgrounds demonstrated in Beirut against Syrian military occupation and for the disarming of militias and terror groups. 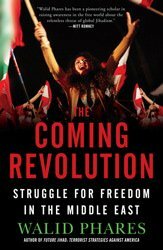 That gigantic effort was the first non violent popular uprising in the Arab world and the Middle East, of that magnitude. It led to the withdrawal of the Assad Army from Lebanon in April, under pressures by the US, France and the UN Security Council. I had the honor of helping Lebanon's civil society express itself by joining efforts and advising NGOs on reaching out to the United Nations Security Council between May 2000 and March 7, 2005. Efforts that resulted in the voting of UNCR 1559 in September 2004 and subsequent resolutions. On March 7, 2005 we lodged a demand at the UNSC to use Chapter 7 of the Charter to implement the resolution. On March 8, pro Assad and Hezbollah forces organized a massive counter Cedars Revolution march in support of the Syrian and Iranian regimes with close to 250,000 participants. That night I was asked on Fox News if the people of Lebanon has expressed its opposition to the UN resolution. I answered, "you will hear from Lebanon's silent majority soon." One week later, on March 14, one million and a half marched through Beirut calling on the withdrawal of occupation forces. The world realized that silent majorities rise when they can. The Cedars Revolution was a prelude to the Green Revolution against the Ayatollahs in Iran in 2009 and to the Egyptian Revolution against the Ikhwan in 2013. Unfortunately the politicians in Lebanon failed to pursue a coherent strategy to disarm the militias and as of 2008 Lebanon fell back under Hezbollah control. But the silent majority is still determined, when future leaders would emerge, to rise again. 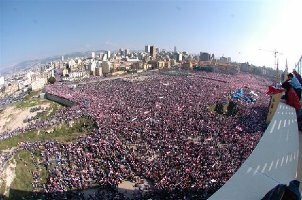 Today is the 11th anniversary of the Cedars Revolution, the first Middle East non violent popular mass uprising.